Count on Becknell’s decades of experience to deliver a full range of real estate solutions to meet your industrial needs. As a developer, owner, lessor and property manager, Becknell takes an integrated in-house approach to serve industrial clients of all sizes across the country. 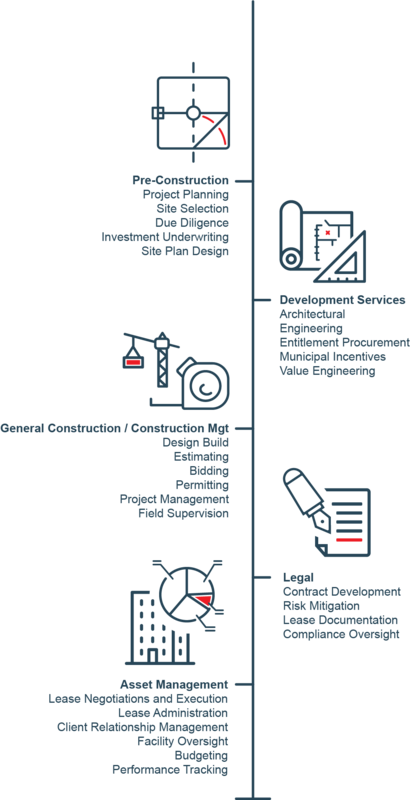 Efficiency and quality are the cornerstones of Becknell’s approach, providing complete end-to-end development that consistently delivers a high-value, low-cost solution to our clients. At the core of Becknell’s superior delivery system is our design-build construction capabilities. Becknell’s vertically integrated approach takes our experienced team of architects, engineers and construction managers collaborating together with the client early in the project to ensure that we deliver the most functional high-value product as possible. Becknell builds the entire spectrum of industrial facilities nationwide, designing and constructing modern, state-of-the-art buildings to meet the changing needs of our tenants. Becknell offers property management services for its entire portfolio. Our team is committed to complete customer satisfaction, with a proven track record of long-term tenant relationships and customer loyalty. As both the developer and property owner, Becknell understands the direct connection between optimal functionality of an industrial space and the success of our tenants’ operations. Becknell’s experienced and dedicated leasing team coordinates the delivery of premier industrial real estate solutions to new clients, while ensuring the satisfaction of our existing clients. Whether you’re running a small business or managing a national company, Becknell will work with you to fully understand your specific requirements and find the perfect location within our expansive portfolio. Becknell purchases primarily single tenant, mid-size premier business distribution and light manufacturing facilities nationwide with a preference for growing businesses providing additional development, expansion & acquisition opportunities. We provide all cash closings through our existing discretionary lines of credit and cash available.